Ash (Bruce Campbell) returns for more run-ins with the Deadites in Evil Dead 2, Sam Raimi's "sequel" to his cult classic Evil Dead. 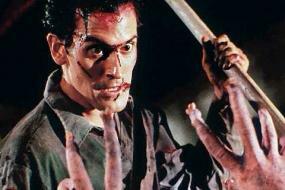 Evil Dead 2 is more like a remake of Evil Dead than a true sequel, with the story almost completely mimicking that of the earlier film. The reasons for this are twofold: Raimi was unable to secure scenes from the first movie due to legal issues with the distributor, and he wanted to remake his first film, since he now had a more significant budget to work with and was free to include the sort of tongue in cheek humor for which the horror film is now famous. In Evil Dead 2, it is just Ash and his girlfriend, Linda, who come to the lonely cabin in the woods, and they find the recordings of the professor's translation of passages from the Necronomicon. Of course, Ash plays the tape, and the recited passages awaken the evil lurking in the forest right away. Linda is possessed by the evil immediately and attacks Ash, forcing him to defend himself and dismember her with a chainsaw. This leads to one of the first truly humorous moments in the film, when Ash has a conversation with his reflection. "We just cut up our girlfriend with a chain saw. Does that sound all right to you?" Ash is now left alone to fend off the evil spirits which are attacking from all sides. In one of the most hilarious bits ever filmed in a horror movie, his hand becomes possessed and attacks him. Campbell shows off amazing physical prowess as he appears to be quite convincingly out of control of his hand, which is harassing him with the classic Three Stooges two-fingered eye-poke and breaking dishes over his head. Ash succeeds in lopping the hand off at the wrist, but now it is free to roam about the cabin on its own, a demonic version of Thing from The Addams Family. Of course, there wouldn't be much of a movie if Ash were alone the whole time, so we soon learn that a group of people are coming to the cabin to join him. The daughter of the anthropologist who owns the cabin is transporting some missing pages of the Necronomicon, which her father needs. She has her boyfriend and a pair of local residents with her, and when they reach the cabin and find Ash, they assume he has murdered her parents. The men attack Ash and lock him in the fruit cellar, just before learning that the professor's wife (who had been previously possessed) was buried down there. Ash must defend himself against this new Deadite and prove to the others that he is as innocent as they are. More Deadite attacks and possessions follow, a particularly disturbing yet amusing scene involving a flying eyeball occurs, and the key to destroying the evil and sending it back into the abyss from whence it came is discovered to be hidden within the pages of the Necronomicon. The passage is recited, and the evil is indeed sent back to the middle ages. The problem is, so is Ash, his shotgun, chainsaw, and Oldsmobile Delta 88, thus setting the stage for the next movie, Army of Darkness. Groovy. 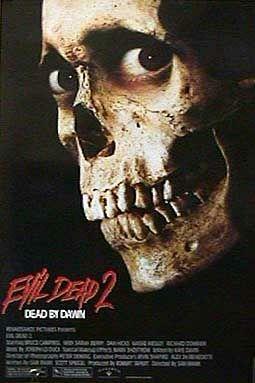 While Evil Dead was certainly something of a cult hit, Evil Dead 2 surpassed it by far. The film established Raimi as a director to watch, made a quasi-star of Campbell, and inspired McFarlane Toys (owned by Spawn creator Todd McFarlane) to create a line of action figures, although most of these actually were based on characters seen in Army of Darkness. It also inspired a generation of fanboys who use names like "Ash" and "Deadite" on internet message boards and chatrooms. The popular video game character Duke Nuke'em owes nearly his entire repertoire of catch phrases to the character of Ash as well.